You’re happily making your recipe and then find your tofu is too sloppy for the job. If you’re in the UK, chances are you are using Cauldron tofu. It contains more water than practically all other UK firm tofu brands. This can easily be overcome by pressing it to release some of the water. Here are two methods that we use. Both are easy, almost so easy that it’s obvious, you just you need to plan ahead as it takes 30-60 minutes. Place a sieve over a small bowl or jug. Open your tofu, drain and rinse it. Place it into the sieve and leave for 30 minutes to an hour (or longer). 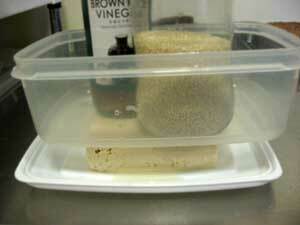 This method is easy, but not as effective as doing a proper press, where you’ll get more than twice as much water out. It depends how firm you need your tofu, something you’ll discover by trial and error. If you’re not sure, go for the second method – pressing – which is also easy to do. 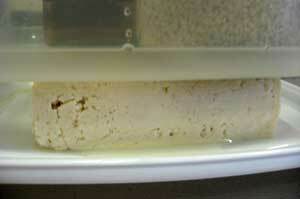 Place tofu on a plate or tub lid – anything with a lip to stop the water escaping and make less mess for you. Put a plate or tub on top of the tofu and then a heavy weight. A full jar or tin or bottle will do. Make sure the weights are fairly well balanced, or they might topple off during the draining process. Leave for 30 minutes to an hour (or longer). Drain the water off and use. Hey! 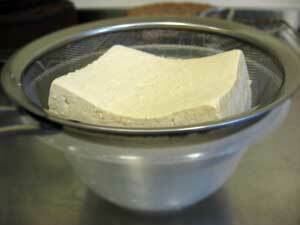 I make tofu from the soybean! Make the milk, curdle it and press the curds! Fun process and you control everything. I love tofu! Thanks for sharing! I’m a big fan of tofu too, and use it quite a lot. Really like your blog btw. That looks a bit simpler than my current pressing method which involves two plates, muslin squares and heavy old books! Haha it’s all good messy fun.